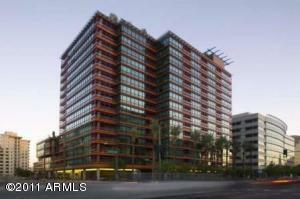 Beautiful, modern unit located in the East Tower on the southeast corner of the 8th Floor. GORGEOUS city and mountain views. Split floor plan, carpet in bedrooms, wood plank floor in main area, with tile in all the right places. Fresh, neutral paint, granite counter tops in kitchen and baths, SS appliances. Optima showcases gorgeous sky gardens, roof top pool, plus concierge services through management, fitness center. Close to Biltmore dining, shopping and entertainment. Managed by professional agent. Listing courtesy of Butler Realty Services.